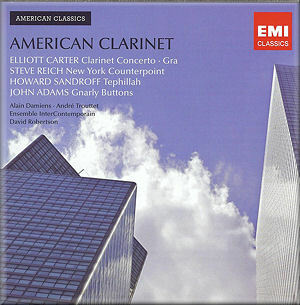 This disc contains some of the masterpieces of twentieth century American clarinet writing. Elliott Carter’s Clarinet Concerto starts, in the expert hands of Alain Damiens and the Ensemble InterContemporain. Composed in 1996, this is a rich work with lyrical lines, moments of exquisite beauty and contrasting fast-moving passages which are energetic and complex but never impenetrable. The ensemble is formed predominantly of wind, brass and percussion, with just five solo string players adding colour. Carter treats the ensemble as a series of instrumental groups, linked by the clarinet soloist, providing timbral variety for each of the sections while retaining an overall sense of unity. The slow-paced sections have a beautifully lyrical quality, while the faster moments have an enjoyably biting panache. This is an excellent performance which lives up to the high standards one has come to expect from this ensemble. The harmonic simplicity and slowly transforming patterns of Reich’s New York Counterpoint provide a fascinating contrast. The difference between the two works is stark, demonstrating varied aspects of the contemporary clarinet. Here, the instrument’s timbre takes centre-stage, and the unified tone of all the tracks is one of the main features. Each of the sections makes use of different rhythmic characteristics, and I particularly enjoyed the final fast section with its pounding bass note accents and syncopations. Gra is a short, virtuoso solo work for clarinet by Carter, composed in 1993 as an 80th birthday tribute for Lutoslawski. The Polish title means ‘play’ and corresponds to the playful nature of the work. Here Carter’s wit is in full flow, and this challenging work is both light-hearted and high-spirited. Howard Sandroff’s Tephillah for clarinet and electronics repeats motivic patterns in the style of a mantra, with live electronics used to add an extra, unpredictable dimension in performance. The electronics are performed as a duo with the live performer, using reverb, delay lines and chorusing at different points in the work. The music is based on Hebrew chants, and is in three contrasting movements which are heard without break. The last work on the disc is Gnarly Buttons by John Adams, with André Trouttet the able clarinet soloist. One has the sense with this work that it is almost autobiographical; Adams played the clarinet himself in marching bands, and was introduced to the instrument by his father through the music of Benny Goodman. Jazz elements can be detected here, particularly in the solo line, as can the regular pulse of the marching bands. Adams’ musical language is relatively - at least in comparison to Carter’s - simple, but highly effective; despite the conventional nature of this concerto, the orchestration makes use of some interesting sounds, including computer-generated samples, cor anglais and banjo. The central movement is a dancing Hoe-Down, subtitled Mad Cow, with interrupted lines and a developing sense of fun. By contrast, the final movement is an expressive, contemplative ballad, with simple tonality used to create an easily accessible sense of emotion at the opening. The subtext to this movement is said to be a depiction of Adams’ father’s struggle with Alzheimers, and this poignant opening is both expressive and touching. Rhythms are used to add a sense of tension and disarray, as the music becomes more complex, dissonant and chaotic as it progresses. This is an enjoyable CD with high quality playing throughout. The programming is interesting and varied, showing the multi-faceted compositional output of some leading twentieth century American composers.